Hi everyone! 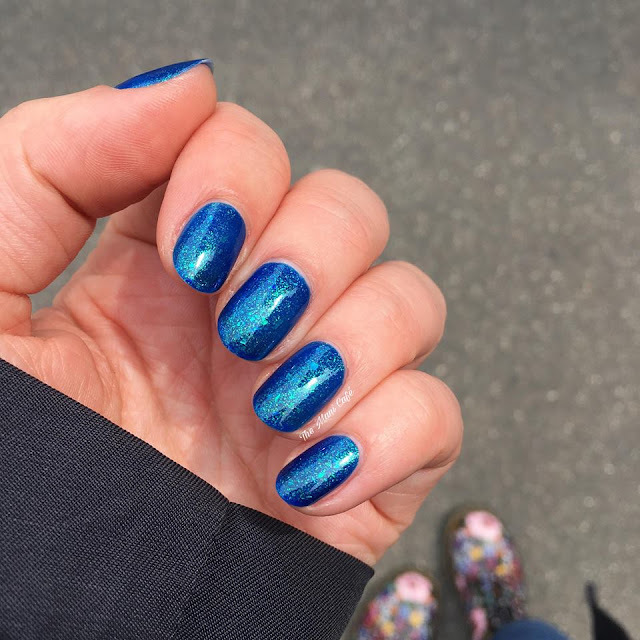 Today I am crazy excited to show you this stunning polish called Where the Sky Meets the Ocean by STELLA CHROMA. This is a custom for the Facebook fan group, STELLA CHROMAtics. The group members voted on the colour and finish etc. I have to admit, I didn't vote for blue but I am so glad it won the poll! Where the Sky Meets the Ocean is a 'vibrant blue with sparkling blue/green/yellow shifting Aurora pigment and some green/yellow flakies'. It has so much depth and just GLOWS! It's been a while since I've been so obsessed with a new polish. If you choose to purchase it, I'm sure you won't be disappointed! I used 2 coats and topcoat and the formula was perfection! I posted this pic on Instagram and you can really see how the flakes just pop! This beauty will be on sale June 15th noon EST through midnight August 31st and will retail for $12.00. You must be a member of STELLA CHROMAtics (names will be checked). Feel free to check out the Facebook group for photos, info and fun related to the brand as well. Right now I am so happy I am a Stella Chromatic - this polish is right up my alley!!! And it looks so gorgeous on you!! !